Kim, J., Stewart, B. and Weiss, R. H. (2016). Extraction and Quantification of Tryptophan and Kynurenine from Cultured Cells and Media Using a High Performance Liquid Chromatography (HPLC) System Equipped with an Ultra-sensitive Diode Array Detector. Bio-protocol 6(7): e1781. DOI: 10.21769/BioProtoc.1781. Evidence of the involvement of tryptophan and its metabolite, kynurenine, in various biological processes including cancer is constantly expanding. Analysis of cell extracts and culture media can allow for quick snapshots of the metabolic fluctuations occurring in vitro. Here, we describe a method for metabolite extraction from mammalian cells and analysis of extracted metabolites and cell culture media by HPLC with detection using an ultra-sensitive diode array detector. The protocol requires a minimum of 1 x 106 cells to accurately detect tryptophan and kynurenine levels. If tryptophan and kynurenine quantification is desired from fresh media, collect 2 ml of fresh media prior to cell addition for subsequent analysis and freeze at -80 °C. This sample will be used to measure the baseline levels of tryptophan and kynurenine in the media. If cells of interest are adherent cells, then proceed to step A2a. If cells of interest are suspension cells, then proceed to step A2b. If desired, the cell culture can be spiked with an internal standard such as 3-nitro-L-tyrosine (a final concentration of 20-50 µM is generally appropriate) at this time. The internal standard can be used to quantify metabolite recovery. At the completion of the treatment schedule, collect 2 ml media in 2 ml microcentrifuge tubes. Centrifuge at 2,000 x g at 4 °C in centrifuge to pellet cells/debris from the media. Without disturbing the pellet, transfer media into two labeled tubes of equal volume. One will be used for immediate analysis while the other will serve as a backup. At this point, cell-free, centrifuged culture media can be stored at -80 °C until analysis. Media can be analyzed by HPLC without the need for extraction. Next, aspirate off remaining media in plate/flask where cells are grown. Wash cells with cold (4 °C) phosphate buffered saline (PBS) twice. Afterwards, dislodge cells from culture plate/flask by scraping. Collect liberated cells and place into 2 ml microcentrifuge tubes. Centrifuge at 2,000 x g at 4 °C in centrifuge. Proceed to step A3. At the completion of the treatment schedule, collect all media containing cells into appropriate volume conical tubes. Centrifuge at 2,000 x g at 4 °C in centrifuge to pellet cells/debris from media. Without disturbing the pellet, transfer 1 ml of media into two labeled tubes. One will be used for immediate analysis while the other will serve as a backup. At this point, cell-free, centrifuged culture media can be stored at -80 °C until analysis. Media can be analyzed by HPLC without the need for extraction. Next, wash pelleted cells with cold (4 °C) phosphate buffered saline (PBS) twice. Proceed to step A3. Centrifuge cells at 2,000 x g at 4 °C and aspirate PBS without disturbing the cell pellet. Keep cells on ice while pipetting PBS. To quench metabolism and extract metabolites, add 200 µl ice-cold 50% methanol/50% PIPES-EDTA to the cell pellet. To the quenched cell mixture, add 200 µl ice-cold chloroform and vortex vigorously for 45 min at -20 °C. (Note: This extraction length is important when extracting metabolites from organisms with cell walls including bacteria and yeast. A shorter extraction time of 5-10 min is adequate for mammalian cells. Vigorous vortexing is most effective for metabolite extraction. Use of a multi-tube vortex mixer head is recommended.) Afterwards, centrifuge at 21,000 x g at 4 °C for 10 min. Collect upper, water/methanol phase in a clean labeled tube. This is the first metabolite extract. Place tube on ice. Re-extract the chloroform phase by adding 200 µl of ice-cold 50% methanol/ 50% PIPES-EDTA. Vortex for 1 min and centrifuge again at 21,000 x g at 4 °C for 10 min. Just as before collect the upper, water/methanol with the extract from step A5. Freeze the extract until analysis. Analyze metabolites from cell culture media and from cell extracts by HPLC. To separate and quantify tryptophan and kynurenine, inject 5-20 µl (Note: The required injection volume will vary depending on the concentration of metabolite in the sample and is a recommended range.) of the cell extract obtained from step A7, spent culture media collected in step A2, or the cell-free media collected from step A1 in an HPLC equipped with an ultra-sensitive diode array detector and a Hypersil GOLD C18 column (50 x 2.1 mm, 3 µm), which is a reverse phase column packed with spherical, fully porous ultrapure silica. Set column temperature to be maintained at 30 °C. Use an isocratic mobile phase of 15 mM potassium phosphate (pH 6.4), with 2.7% (v/v) acetonitrile with a flow rate of 0.8 ml/min. The run time should be set for 10 min. Quantify the area under the peaks that display absorbance at 286 nm and 360 nm to calculate the concentration of tryptophan and kynurenine, respectively, in the samples. Generate standard curves ranging from 0 to 200 µM for both tryptophan and kynurenine and other metabolites of interest as well as any internal standard (if applicable) using authentic standards. Standards of each concentration should be prepared in triplicate and measured in triplicate. A recipe for a standard mix is included in the Recipes section. Note: Details of standard curve generation will vary depending on the chromatography system and data analysis software used. Consult the manufacturer’s documentation to generate a standard curve with your instrument’s software. Figure 1. HPLC chromatogram showing separation of tryptophan, kynurenine, kynurenic acid and nitrotyrosine standards. Quinolinate is also present in the standard mix but below the limit of quantification. The upper panel shows absorbance at 360 nm, and the lower panel shows absorbance at 286 nm. The tryptophan metabolite kynurenic acid and 3-nitro-L-tyrosine (nitrotyrosine), which can be used as an internal standard, are also separated. All analytes are present at a concentration of 12.5 µM. The standard solution was prepared as described in the Recipes section. This method can be modified for compatibility with liquid chromatography-mass spectrometry by using a mobile phase consisting of 10 mM ammonium formate (pH 6.4), containing 2.7% acetonitrile. Other chromatographic conditions remain unchanged. If desired, a known quantity of 3-nitro-L-tyrosine can be added to samples prior to extraction for use as an internal standard. Prepare 3 mM PIPES-3 mM EDTA (pH 7.4) (for 500 ml). Mix 0.453 g PIPES and 0.438 g EDTA in 400 ml of sterile water (HPLC grade). After the solution becomes completely dissolved, complete to 500 ml with sterile water. Filter the solution. Mix the above with 500 ml of Methanol (HPLC grade). Degas and store at 4 °C. Make 1 M stock solutions of both monobasic anhydrous (KH2PO4) and dibasic anhydrous (K2HPO4). Mix 72.2 ml of KH2PO4 and 27.8 ml of K2HPO4 dilute with 900 ml of sterile water (HPLC grade) to make 100 mM stock. Take 150 ml of the 100 mM stock and dilute with 850 ml of sterile water (HPLC grade) to make 15 mM potassium phosphate stock. Filter the solution. Add appropriate amount of acetonitrile (HPLC grade) fresh when running HPLC separation. Degas and store at room temperature. Prepare each standard separately at a concentration of 1 mM in 50 ml mobile phase [15 mM potassium phosphate (pH 6.4) with 2.7% acetonitrile]. For each solution, weigh out an appropriate quantity of each standard and place in a 50 ml volumetric flask. Record the actual mass of each standard. To each volumetric flask, add 50 ml mobile phase and mix. The standards, especially kynurenic acid, may require more than an hour to go into solution. A stir bar can be added to each flask and stirred on a stir plate to facilitate dissolution of the standard. When each solution is ready, add 2 ml of each standard 1 mM standard solution to a 15 ml tube and vortex mix. The final concentration of each standard in this standard mix will be 200 µM. Perform replicate serial dilutions as required to make a series of standards for use in generation of a standard curve. Note: Serial dilutions of standards are generally satisfactory but can propagate concentration errors if the stock solution concentration is not correct. This work was supported by NIH grants 1R01CA135401-01A1, and 1R01DK082690-01A1, the Medical Service of the US Department of Veterans’ Affairs, and Dialysis Clinics, Inc. (DCI) (all to R. H. W.). This work was performed in part at the Research Resource for Biomedical Accelerator Mass Spectrometry, which is operated at LLNL under the auspices of the U. S. Department of Energy under contract DEAC52-07NA27344. The Research Resource is supported by the National Institutes of Health, National Institute of General Medical Sciences under Grant P40 RR13461. The extraction protocol was adapted from Villas-Boas et al. (2005). The HPLC method was adapted from Laich et al. (2002). Laich, A., Neurauter, G., Widner, B. and Fuchs, D. (2002). 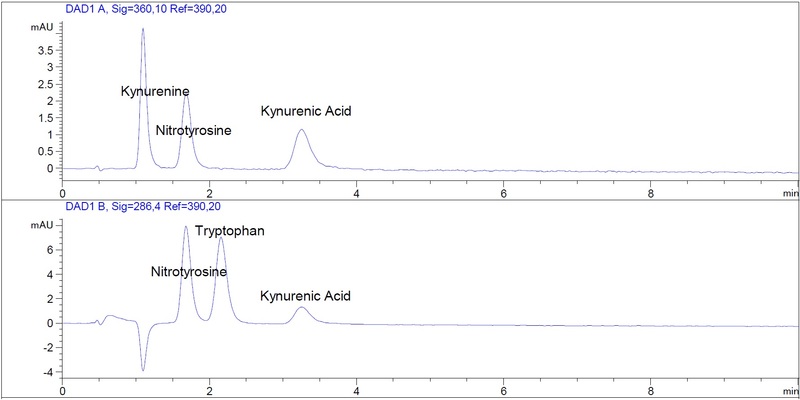 More rapid method for simultaneous measurement of tryptophan and kynurenine by HPLC. Clin Chem 48(3): 579-581. Villas-Boas, S. G., Hojer-Pedersen, J., Akesson, M., Smedsgaard, J. and Nielsen, J. (2005). Global metabolite analysis of yeast: evaluation of sample preparation methods. Yeast 22(14): 1155-1169. How to cite: Kim, J., Stewart, B. and Weiss, R. H. (2016). Extraction and Quantification of Tryptophan and Kynurenine from Cultured Cells and Media Using a High Performance Liquid Chromatography (HPLC) System Equipped with an Ultra-sensitive Diode Array Detector. Bio-protocol 6(7): e1781. DOI: 10.21769/BioProtoc.1781.